Every now and then a recipe grabs me, and I mean reeeaaallly grabs me. Like, by the balls and won’t let go. The last was this Tangy Veggie Wrap, and these Zoodles with Exquisite Hazelnut-Carrot Sauce are the next. I ate them yesterday, and I’ll eat them again tomorrow! ‘But what’s a zoodle?’ I hear you cry. Well, that clever name actually refers to noodles made from zucchini – by your very own fair hand. They couldn’t be simpler or quicker to make – just grab one of these spiralizers if you don’t have one already, and get zoodling! The zoodles are a massive part of this recipe – and have much to recommend them over traditional pasta, spaghetti or noodles (more on that later) but it’s the blend of the rest of the ingredients and the sauce that really sets this recipe apart. If you look at the ingredients list it’s actually very simple (even a little plain looking, to the naked eye) but somehow it all comes alive when thrown together. Every taste compliments another, and the little bursts of flavour that strike out on their own will be sure to delight any palate. 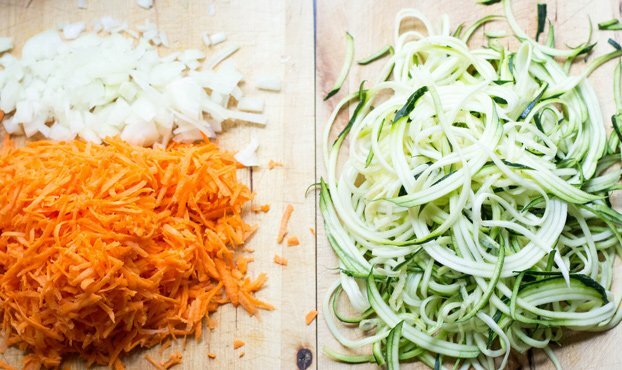 There’s a reason why spiralized veggies are so popular right now. What have you got to lose? Weighing in at around ⅛ the calories and ⅛ the carbs when compared to regular pasta, spaghetti or noodles the properties of zucchini are really quite astounding. 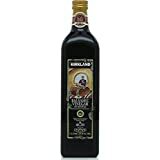 They’re also very filling – and won’t leave you with that lethargic, gluten-heavy feeling many people get after a bowl of pasta. This recipe also includes the awesome carrot – more and more detailed research is coming in on them – and it’s all good news. Carrots provide huge amounts of different vitamins, nutrients and beta carotene; in a nut (carrot?) shell they’ll help to protect you against cardiovascular disease, cancer and many other illnesses (1). And did I mention nuts? Well, maybe in the first sentence of this post, but allow me to expand. This research from Harvard shows that nuts reduce cholesterol, lower the risk of type 2 diabetes, colon cancer, gall stones and heart disease. And keep you slim. Wowww!!! 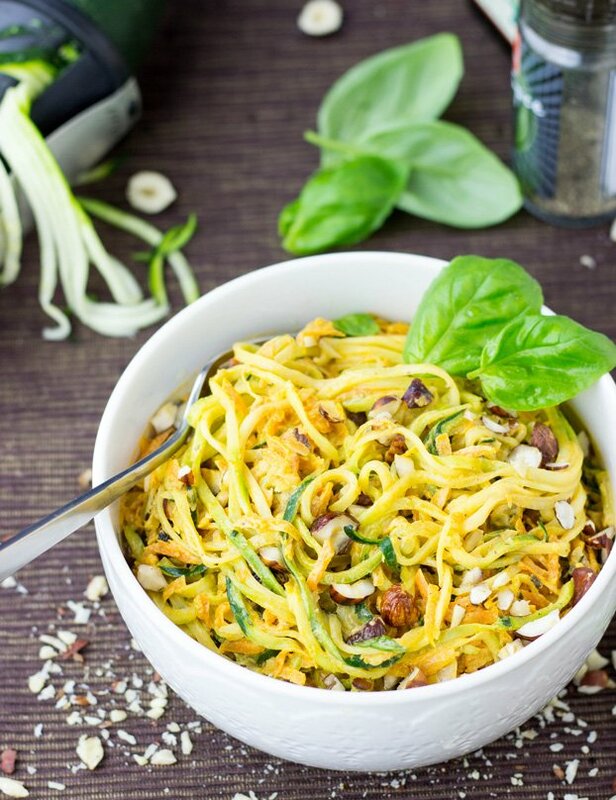 Zucchini Noodles (Zoodles) with Exquisite Hazelnut and Carrot Sauce. Deliciously creamy with ⅛ the calories and carbs of regular pasta! Use a spiral maker to make the zoodles or if you don’t have one just simply dice up the zucchini. Peel and grate the carrots (if you buy organic carrots then you don’t really need to peel), dice the onion. Put the zoodles in a big frying pan with oil and cook them on medium heat. Add the oil, onion and carrot mix to the hazelnuts and fry gently on a medium heat until soft but not browned. Turn the heat off and mix in the tomato purée and créme fraiche and stir ‘til everything is mixed well (make sure it doesn’t boil or burn!). Season to taste with salt and pepper. And last but not least add the sauce to the zoodles and mix in. If you want you can garnish it with a sprig of fresh basil. Recipe inspired by Vegetarian Living. Hazelnut carrot sauce?! <3 <3 That sounds AMAZING. I love zoodles, but I have a feeling I'm going to like them much, much more with that sauce on top. This looks so great! I love all the flavors you have going on. And zoodles are awesome!! SO fun to make and eat! Love this! 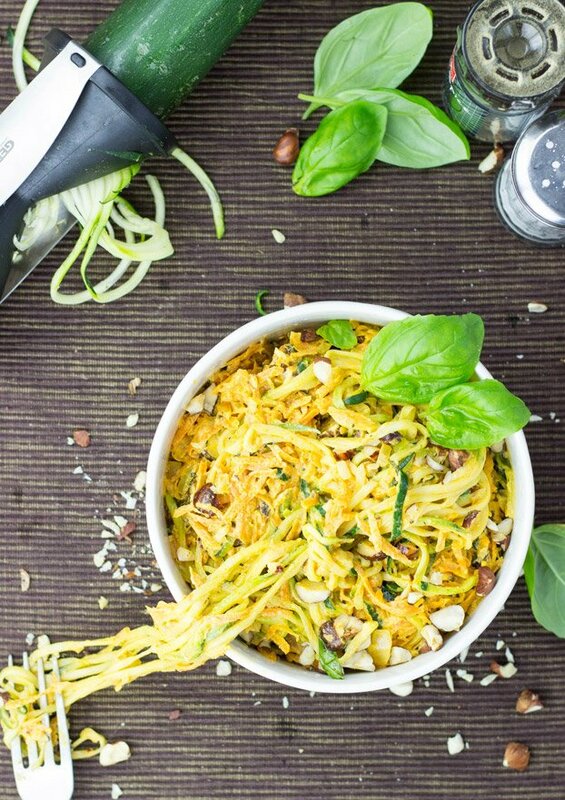 I love zucchini noodles but have never made them myself. Need to get a spiralizer! I love the hazelnut carrot sauce on this. That sauce sounds incredible! I could use plain vegan yogurt to make it work for me. I’d definitely squeeze lemon or lime juice over it for a bright finish. YUM! 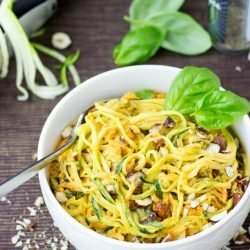 I really love this combination – I would not have thought about adding a nutty sauce to zoodles! This looks delicious! Love zucchini recipes! This recipe looks amazing. The hazelnut carrot sauce is such a great idea. I’m pinning this one for later Thanks for sharing. I’ve never thought of hazelnuts as savory…too much nutella exposure I guess! Great idea! Super cool and creative. 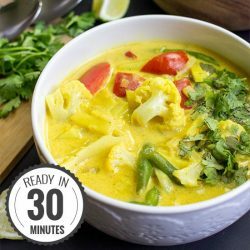 Really unique and shows off your cooking chops! A courgette sounds more like a sportscar to me though. The hazelnut carrot sauce is brilliant. And together all of it sounds so delicious! Yum! 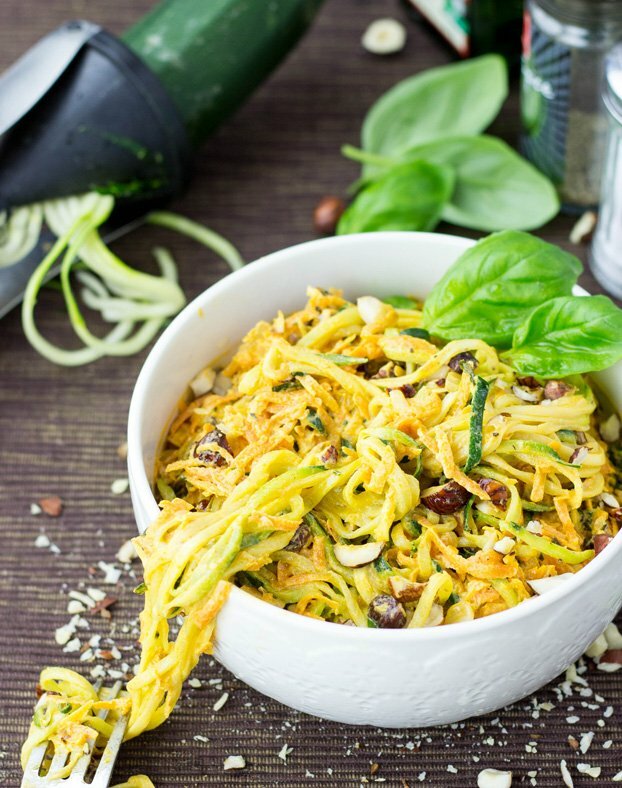 I love cooking with zoodles and I will be adding this recipe to our list! Thanks for sharing! I’ve never had the pleasure of trying hazelnut carrot sauce and now I simply HAVE TO!!! yessss! !Roast them beforehand, you’ll love the smell!! I just spit out my wine w that first line!! baahaaa!! I don’t want to be grabbed by my balls but a nice kick in the arse from a fab dish would be just fine w me!! I have not tried zoodles yet, but I really have wanted to try them. 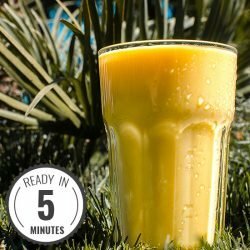 I love this recipe sounds delicious and healthy. Thanks for sharing!! 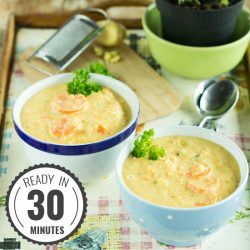 Super Rezept ! Eine ganz neue Geschmacksnote, dank der Haselnüsse. Hätte ich sonst nie ausprobiert. 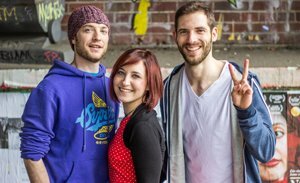 Fand ich auch clever von Ihr, die Haselnüsse hinzuzufügen. Thank you everyone for sharing your appreciation and love. One small gripe however ( I do not wish to be ungenerous, just constructive), I wish that people could comment more after they’ve made the dish so a ‘review’ really meant a review, not just a person’s impressions. This approach not only enables you to consider if and when to make (friends/ dinner party? etc) but also gives you insight into different interpretations and alternate methodilogy. The internet is after all, an international space.Thank you for sharing this recipe. I have made it, used a mandoline not a spiraler (worked well) also used a squeeze of lemon at the end. Will make again. Terrific. Thank you! Can you make this ahead and reheat?? Hello! The spiralizet on the link, is it of good quality? Is it the same one you guys are using? I’m looking for a durable one that would last long. Thanks in advance. So for that task I think the price – value ratio is great. Buut, if you plan to spiralize more, maybe also sweet potatoes and other veggies, you’ll be better off with a higher quality product for sure! I made this. It was good. There is no seasoning in the recipe so I added salt and pepper. I didn’t have hazelnuts so I used mixed nuts. It would also be good with more flavors, maybe ginger. 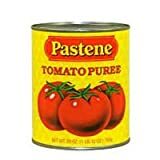 Next time I am going to use peanuts and maybe add a little peanut butter in place of the tomato paste, or in addition to it. Hey Vicki, glad to hear you enjoyed it! Definitely a good way to use zucchinis :). Salt and pepper should be visible on the list, but the other additions sound great too. I can imagine ginger and peanuts fitting very nicely to it!